First confirmed nesting of Solitary Sandpipers in Montana! Although knowledge about the status and biology of Montana’s birds is far from complete, we have a pretty good handle on which species on the state list breed and which do not. Most of the recent additions to the state breeding list have come from species that are expanding their range northward from the Great Basin, including Gray Flycatcher, Blue-gray Gnatcatcher, Lesser Goldfinch, Great-tailed Grackle, and Black-throated Gray Warbler (Hendricks 2004, Marks et al. 2016). Another addition, the Arctic Tern, normally breeds at high latitudes but inexplicably has nested several times on a prairie wetland in north-central Montana (Dinsmore and Jorgensen 2001). 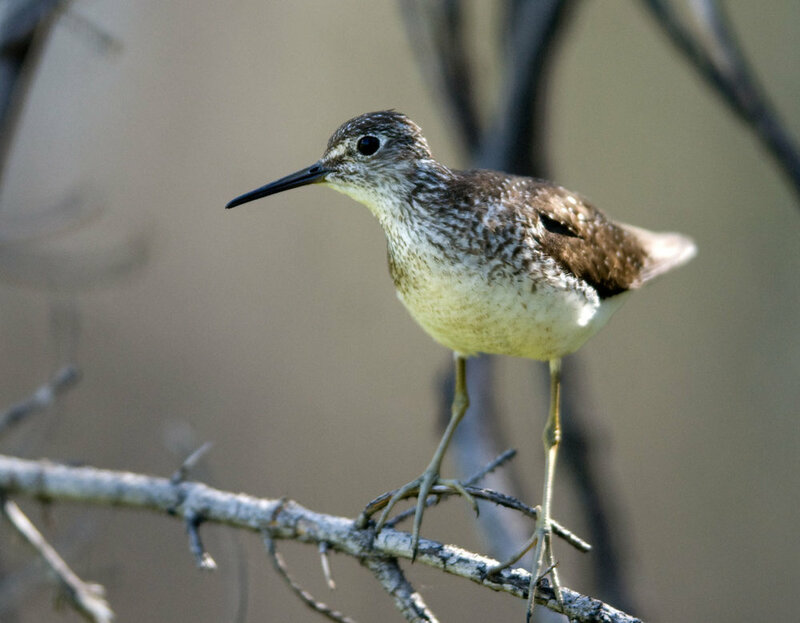 In the summer of 2018, the Montana Bird Advocacy will begin surveying small lakes on the west side of Glacier National Park in search of nesting Solitary Sandpipers. We hope to assemble a small team of dedicated volunteers who will hike into lakes and watch and listen for sandpipers, and hopefully document breeding by finding nests or observing flightless young accompanied by their parents. Please contact Jeff or Paul if you are interested in helping our efforts to obtain a complete list of the breeding avifauna of the state! Dinsmore, S. J., and J. G. Jorgensen. 2001. Arctic Terns nesting in Montana: First modern interior breeding records for the lower 48 United States. North American Birds 55: 127-131. Hendricks, P. 2004. First nesting record of Black-throated Gray Warbler (Dendroica nigrescens) for Montana. Western North American Naturalist 64: 548-550. Lundsten, J. 1996. Solitary Sandpiper nesting in Marion County, Oregon? Oregon Birds 22: 40-41. Marks, J. S., P. Hendricks, and D. Casey. 2016. Birds of Montana. Buteo Books, Arrington, Virginia. Paulson, D. 1993. Shorebirds of the Pacific Northwest. UBC Press, Vancouver, British Columbia. Sawyer, M. 1981. Solitary Sandpiper: Probable nesting in Oregon. Oregon Birds 7: 131-133. Distribution of the Solitary Sandpiper (courtesy of Cornell Lab of Ornithology). Territorial Solitary Sandpiper perched in tree at unnamed wetland near Howe Lake, 23 June 2007 (Chris Peterson photo). Migrant Solitary Sandpiper feeding in prairie wetland (Eugene Beckes photo).